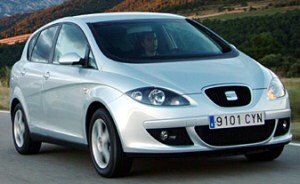 Difference between revisions of "SEAT Toledo (5P)"
SEAT Toledo (5P). 2004–9 (prod. 78,974 approx.). 5-door saloon. F/F, 1390, 1798, 1984 cm³ petrol, 1968 cm³ diesel (I4 DOHC), 1595 cm³ petrol, 1896, 1968 cm³ diesel (I4 OHC). SEAT’s cars were beginning to look the same under Walter de’Silva, with third-generation Toledo reminiscent of an Altea with a high roof. Awkward-looking, though it could not be mistaken for anything else; and roomy thanks to its MPV-style shape. Not the best rearward visibility. Sales eventually dwindled and only a handful left the factory in 2009.